behind cute maternity clothes! I received this dress for a review and after trying it on, I wanted to wear it everyday. 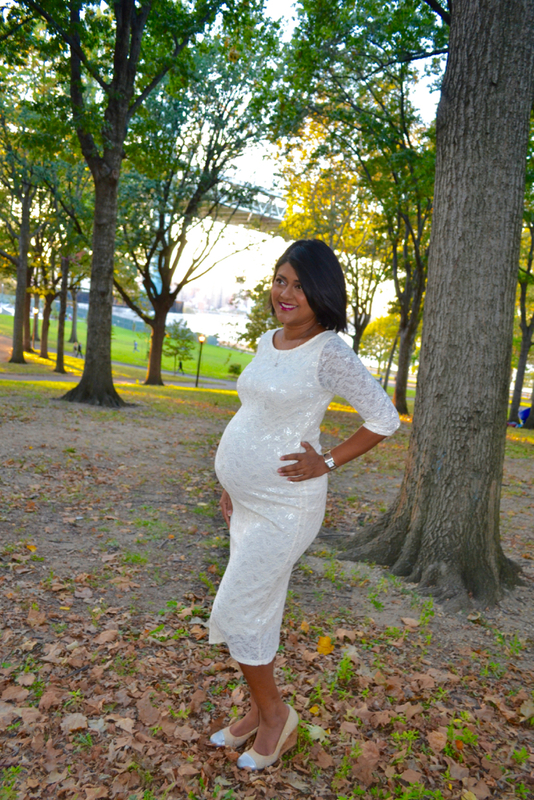 This white lace dress expands with my growing belly and it will be something I will still be able to wear afterwards. I really didn't want to buy maternity clothes because it can be so pricey to buy pieces you will only wear for a few months. However, Pink Blush offers clothes that will grow with you and will also fit after you give birth. This is a plus in my book. In addition, as many know, I love wearing white and this off white dress makes me feel like I am floating. It is so lightweight and comfortable. I love the 3/4' length sleeves and the lace overlay is very girly, which is definitely me! The rounded neck gives a very soft and elegant feel and I am very happy with the length of the dress. Pink Blush Maternity keeps you stylish and comfortable while pregnant at affordable prices! I already know I will also find myself wearing this well after I give birth. Check out my Instagram to enter my Pink Blush Giveaway for a chance to win a $75 gift card!